Introducing the Dashboard and the location. 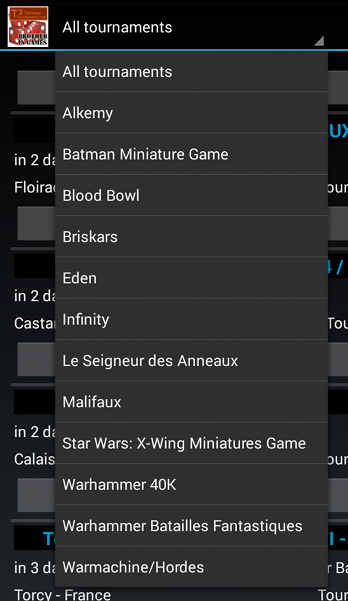 The last release of the MiniWar Companion is on Google Play, and the two first modifications don't need any download. The name have changed and this is the last time we'll talk about the MiniWar. The app is changing to Brothers in Games as that is its final purpose, help gamers play together. This modification comes with a change in the launch icon. I try to reflect what the app is, not only it's an Android app for now. Concerning the app itself, this update introduces the foundation of the real companion app with a Dashboard as the home activity. Of course, the Dashboard isn't fully functional yet. Here you have a preview of what will be available. In the next update, you can manage your own events. 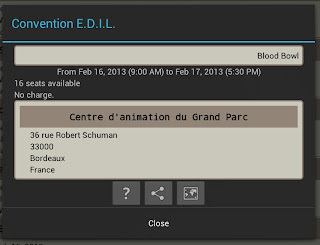 The other feature introduced in this update is the usage of the location to filter for you the next local tournaments. Don't worry, this is only informative, you can still filter the feeds the old way. The app is collecting your location information to filter the feeds on the device. 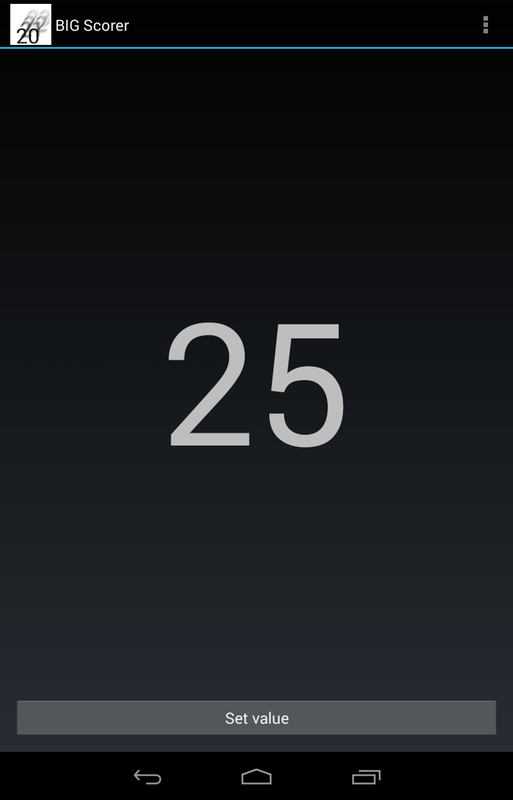 This is done on the device, no information is sent trough the network, neither your location is saved on your device. The app collects the last known position from the location service of your device, it does not actively request your position. This is not the most accurate but it is enough to determine the country, and it is the cheapest in term of power consumption. Yes, we changed the name of the blog. Soon, this modification will be spread to all our media. Yes, we are still providing the Companions apps and this name change is meant for the evolution of the app and services. Brothers in Games will not only help you manage your tournaments. Not only Table Top Tournaments announcements. The redesign of the MiniWar Companion was meant to improve our app by providing you some useful informations within the app. Unfortunately, we know that most of you are in a country which does not use T3 services, so that app is useless. That is how we came to Brothers in Games, and soon, you'll have more informations. Offline tournaments and filtering now available for the Companion. Those are the changes we made for our last release. We gather additional informations about the tournaments from TableTop Tournaments website. The location will now be more precise in the city of the event. French tournament details with the street informations. Unfortunately, this information is not in the feeds, so it takes longer to get them all, and you'll experience it on the first launch. 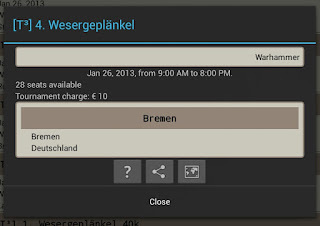 But in the same time, the app save all tournaments information on your device, so you can check it offline. On the next launch of the app, you'll get everything faster. Of course, the street information is used for the location of the tournament. This will give you a more precise location on the map, or for navigation purpose. As the data is cached on your device, the app will try to get updates once a day, on the launch of the app. We have also changed the filtering feature, now you can filter by country and game system. The filters are not dependent on each other, they always list all countries and game systems available on your local list even if the combination leads to an empty list. If you can't find your country or game system in the filter, that means that there is no tournament in the app for your country or game system. Looking for an Alkemy tournament in Belgium ? As we do not control the content of the fields from third party datasource, you may find the same information in the filters but in different languages. Yes, we rely on the name as it is, so filtering by one language will hide the other entries. We are aware of this issue and are working to find a solution. Two unfortunate filters for the same country. Your filtering will be remembered when you'll leave the app, so on the next launch, they will be applied. For convenience, the filter button does not appear in landscape mode on small screen devices. This is made on purpose to let a readable display. Of course, previous filters will still be applied. We hope that you'll enjoy this upgrade. Feel free to comment your opinion about the app. If you still don't use MiniWar Companion, get it now on Google Play.